I worked as an editorial news intern at the Observer Publishing Company during the summer of 2014. While there I published more than 20 articles for a variety of publications including the Observer-Reporter, Total Health, The Almanac and Living in Washington County. I also produced a few multimedia projects to accompany my stories. Twenty-two years after purchasing Tara Hill Farm, Rossi would not have guessed a by-product of her dream would benefit Citizens Library. The Friends of Citizens Library, a group dedicated to raising money for the public library, came up with an unusual, but successful, fundraiser, selling buckets of llama compost cultivated from Rossi’s farm. 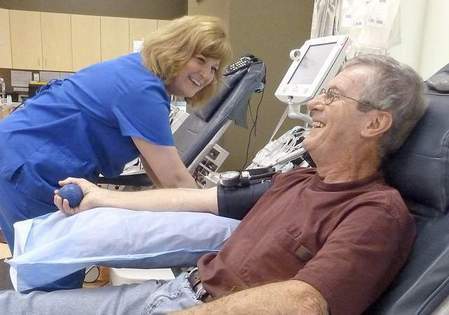 Robert Foflygen, 66, settled on a blue-padded chair at Central Blood Bank’s Washington donor center as casually as if it were his sofa. On Tuesday, Foflygen’s seat sported a bundle of balloons, signaling his 300th blood donation at the center on West Beau Street. Tonight is high school band night at the Washington County Fair, followed by the school bus demolition derby. A week before the event, members of 11 high school bands gathered at the show arena to paint their buses and compete for the best paint job. Sporting a stick-on mustache and stuffed Mickey Mouse tucked under his elbow, Joe Seruppi modeled nonchalantly on a barstool. Similar to the other pint-sized historic figures posing around Burgettstown Area Elementary Center gymnasium, Seruppi was acting as a historic or famous figure for the day – in his case, Walt Disney. With a flick of his stirrups, Coltin Cox bolts out of the gate atop his white horse, wielding a looped rope and aiming for the horns of a bucking steer. As soon as Coltin manages to coil the rope around the steer’s horns, his grandfather rides from behind to secure his rope on the steer’s hind hoofs.